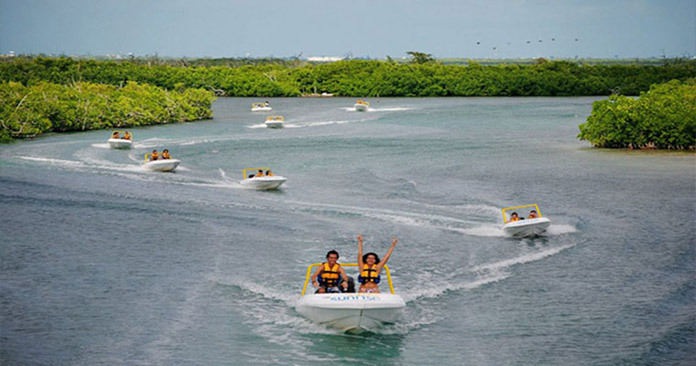 The Cancun Jungle tour is one of Cancun’s most popular tours. 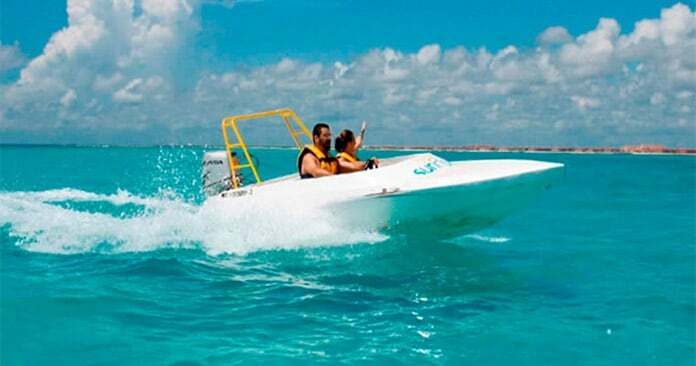 Departing from the heart of the Cancun Hotel Zone this is probably the simplest tour to do, is great value and only takes up half of your day. 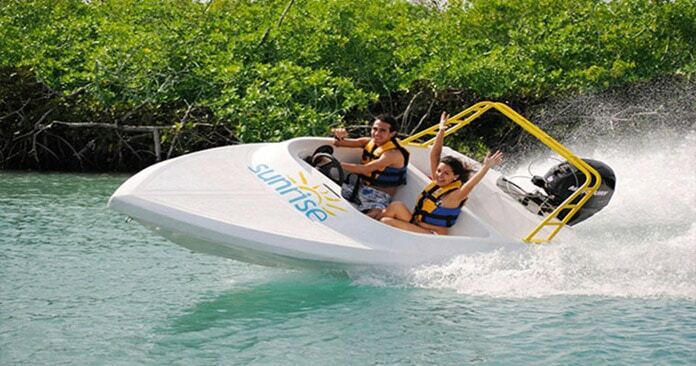 Drive your own speedboat across the vast expanse of the lagoon at high speed. Swerve your way through the mangroves crossing under the road bridge that separates the lagoon from the ocean and out to the beautiful reef, part of the second largest in the World. Once at the reef site the boats are tethered together and you are given an opportunity to snorkel in the beautiful blue Caribbean sea at one of the best snorkeling sites within striking distance of the hotel zone. A myriad of colorful fish and coral formations await. Life jackets are not only provided but their use is insisted upon even for strong swimmers. The journey out to the reef takes 45 minutes and snorkeling lasts for 45 minutes. With a total tour time of approximately 2.5 hours this is an ideal activity that wont take up all your day and is great fun for kids. Departure times are hourly on the hour from 9am until 4pm to suit all itineraries. Top tip – choose an early departure time for the best snorkeling while the reef is undisturbed. 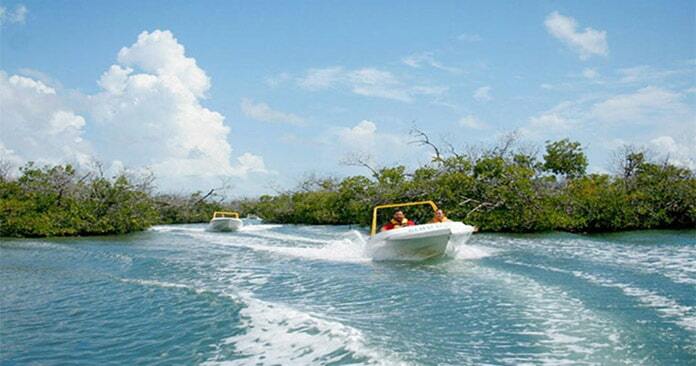 All departures for this jungle tour are from the SUNRISE MARINA located across from the Marriott Hotels and in the same parking lot as the Crab House restaurant. You will need to arrive there 30 minutes before the tour departs. 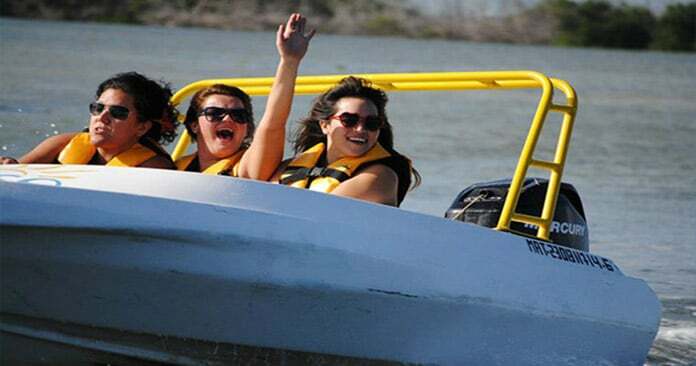 There is a maximum of 2 people per boat and the minimum age to drive is 18. During high season demand is high and space is limited, therefore an extra deposit required if booking for 6 or more people. Transportation. It is easy to take a public bus or taxi to the dock at KM 14.5 Cancun Hotel Zone, next to the Crab House Restaurant.